wardrobe_remix in Adorn Magazine! again! the summer 2007 issue of Adorn Magazine is out! 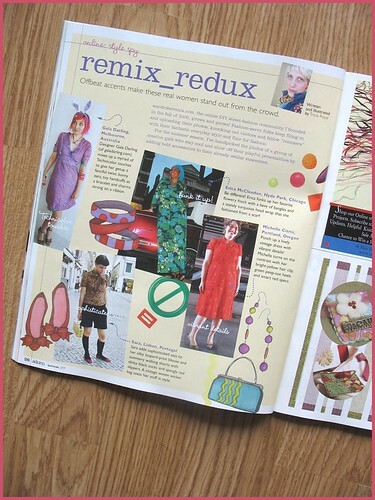 in it is the second installment of my column in the magazine, called "remix_redux", featuring the photos of four amazing wardrobe_remix contributors: gala darling, sara, michelle citrin, and erica mc clendon. thanks for participating ladies!Â the summer column is all about amazing accessories, and how they take an outfit to the next level. and thanks to everyone over at wardrobe_remix who keeps it real, on topic, true to it's mission, and make it what it is! you rock. really and truly! btw: the summer 2007 issue of Adorn Magazine also features an article about DIY/crafty weddings by crafty blogger/writer extraordinare susan beal of west coast crafty, an inspiring patchwork bag fashioned by one of my favorite artists and fellow san franciscans, lisa congdon, and a bevy of brilliant ideas for embellishing your clothing that are beyond cool, such as: adding metallic sequins and rhinestones to your clothing and accessories for some glitz, a big fashion feature inspired by modern artists like jackson pollack, warhol, and matisse (and more) that shows you how go crazy with splatter paint and appliques and other artful decorative techniques on your threads in the most awesome way, and a way cool article about fabric printing with stamps carved from potatoes and other foods and things you can find around your home. and of course, a whole bunch of other stuff, of course. the whole magazine is simply amazing...bravo, Adorn girls, you're really hitting your stride! keep it up!